Talk about Limited Editions! This version of Saints Row IV is limited to a single unit and retails for a stupendous One Million Dollars USD. 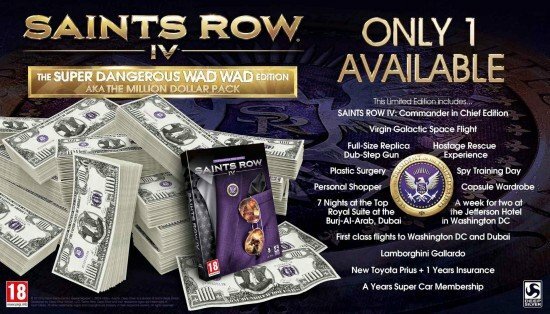 The intent of this price tag is (besides sending you to space) to get as much publicity as possible and we think from that point, Deep Silver (The Game Publisher) has probably gotten more value for their money than they thought possible. Thankfully, they are not going to be stingy for what they offer once you do pay them the asking price. Make sure you email [email protected] if you are really interested in purchasing this edition.